Bethesda, MD, 2019-Jan-29 — /Travel PR News/ — Element Hotels, part of Marriott International, along with Detroit-based Roxbury Group and Means Group, announce today (01/28/2019) the opening of Element Detroit at the Metropolitan, marking the debut of the stylish and eco-focused hotel brand in Michigan. The hotel, which has been incorporated into a renovated 92-year-old neo-Gothic building in the heart of Detroit’s entertainment district, aims to fuel a balanced life for travelers on the road. Designed for today’s healthy, active traveler, Element Hotels has redefined the longer stay experience with a nature-inspired design philosophy that is clean, modern and bright. The Metropolitan Building, was originally opened in 1925 and previously was a destination for jewelers and shoppers alike. The Element Detroit at the Metropolitan boasts 110 studio and one-bedroom guest rooms. The hotel will also be home to a rooftop bar and patio, The Monarch Club at The Metropolitan, with private event space and unparalleled views of downtown Detroit and Comerica Park, the home of the Detroit Tigers. The Monarch Club will be the first of three food and beverage venues to open in the building, and is slated to debut in the first quarter of this year. The property is being managed by Azul Hospitality of San Diego, Calif.
Care was taken throughout the renovation process to preserve as many of the original features of the building as possible, including the exterior façade, an ornate vaulted ceiling in the interior lobby, interior decorative stair cases, and original terrazzo flooring on the guest corridors. The original storefronts of the jewelry stores have also been preserved on the second floor and repurposed as meeting rooms. The new hotel provides guests with many eco-friendly amenities that are an important part of the Element Hotels experience. It features decor and artwork from repurposed and recycled materials, low VOC paint, and every light bulb in the building is LED. All guest rooms provide travelers with a filtered water system within each room. In the bathroom, guests will find low-flow faucets and toilets, as well as environmentally conscious body lotion, shampoo, conditioner and soap, containing certified organic ingredients by Pharmacopia, an all-natural vegan and cruelty-free brand. The hotel’s standard rooms are outfitted with a mini-fridge, microwave and sink, while the studios and one-bedroom guest rooms are outfitted with a refrigerator, sink, microwave, dishwasher and two burner cooktops. The hotel also features more than 5,000 square feet of meeting space, including three event rooms for conferences and gatherings, and 7,000 square feet of ground floor and lower level retail space. Element Hotels aim to allow guests to maintain a healthy and active lifestyle while on the road by offering a complimentary RISE breakfast every morning featuring a yogurt station, a fresh range of whole fruits, and more. Those looking to keep up with their fitness routine can enjoy the 830-square-foot Motion Fitness center, open 24/7. Guests can also take their workout offsite while enjoying the local scenery via Element’s Bikes to Borrow program, which is run in partnership with Priority Bicycles. Complimentary bikes are available upon request for guests to enjoy during their stay. Notable nearby attractions include Campus Martius Park, Ford Field, the Fox Theatre, the Fillmore Detroit, Little Caesars Arena, Beacon Park, the Detroit RiverWalk and Eastern Market. For those looking to unwind after a long day, the hotel offers Element’s signature RELAX reception hour, where guests can enjoy complimentary organic beer, wine, soft drinks and appetizers. Element by Westin®, part of Marriott International, Inc., defies convention through its stylish and sustainable design. The brand’s longer stay comfort empowers guests to ‘Stay in their Element’ through signature amenities including its complimentary healthy Rise breakfast and Relax evening reception, saline swimming pools, spacious fitness centers, Bikes to Borrow program and electric vehicle charging stations. Element made history in 2008 as the only major hotel brand to pursue LEED certification for high-performance buildings brand-wide. For more information, visit www.ElementHotels.com or connect on Facebook and Instagram. Element is proud to participate in the company’s award-winning loyalty programs – Marriott Rewards®, The Ritz-Carlton Rewards®, and Starwood Preferred Guest® (SPG). The programs, operating under one set of unparalleled benefits, enable members to earn points toward free hotel stays, achieve Elite status faster than ever, and seamlessly book or redeem points for stays throughout our loyalty portfolio of 29 brands and more than 6,900 participating hotels in 130 countries & territories. To enroll for free or for more information about the programs, visit members.marriott.com. The Roxbury Group is a real estate development and consulting firm founded in 2005. The firm specializes in complex real estate and economic development projects. Since its founding, the Roxbury Group has developed projects for its own account and others totaling more than $125 million in total project value with $75 million of projects in the pipeline. Most recently, they completed construction on The Griswold, a $24 million, 80-unit apartment building atop a 10-story parking and retail building in Detroit’s Capitol Park and the Plaza, a 74-unit apartment conversion of a former office building in Detroit’s Midtown district. In 2014, they reopened the historic David Whitney Building in downtown’s Grand Circus Park to much fanfare, following a $94 million redevelopment into an Aloft hotel and 105 apartments with first-floor restaurants and retail. Means Group Inc. is a Detroit-based creative land solutions company with more than 40 years of combined experience in various sectors of construction and facilities management. With a main focus on the adaptive reuse of buildings and over 1 million square feet of property development and management experience, Means Group has transformed existing buildings to create vibrant communities and experiences. The most recent example was their redevelopment of the Woodward Garden Development, which the renovation of the historic Garden Theater. Other clients include the Kresge Foundation, Ford Motor Co., Wayne State University, Detroit Public Schools, and Marriott Hotels. Azul Hospitality Group has a robust infrastructure of industry professionals with extensive experience in all aspects of hotel operations and development services. The company’s primary focus is on lifestyle hotels and resorts, with unique destination and product attributes. 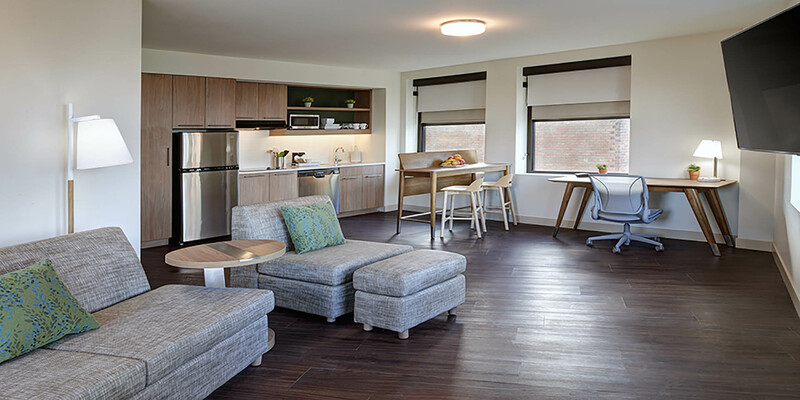 Other recent Marriott-branded Azul projects include Koloa Landing Resort Autograph Collection, The Guild San Diego Tribute Collection, Westin Carlsbad Resort & Spa, Sheraton Redding at Sundial Bridge, Moxy San Diego, and the AC Hotel Phoenix Biltmore. For additional information, go to www.azulhg.com. This entry was posted in Business, Hotels, Luxury, Resorts, Travel, Travel Management, Travel Services, Travelers and tagged David Di Rita, Detroit, Element Hotels, Marriott International, Metropolitan, Toni Stoeckl. Bookmark the permalink.